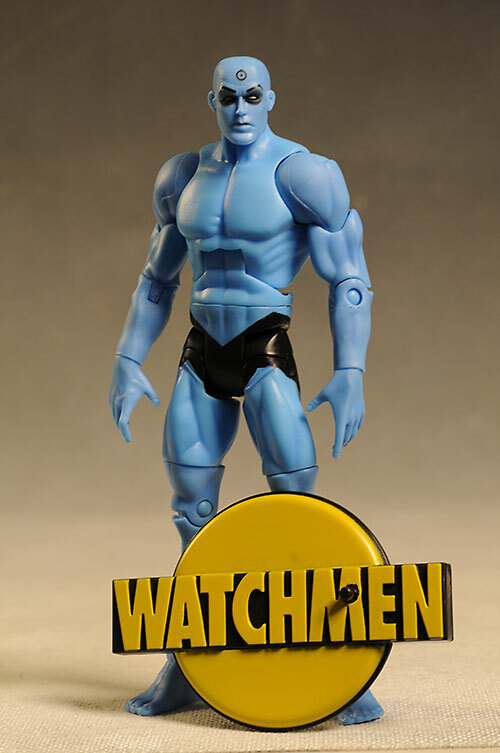 Matty Collector has to get 6 Watchmen figures out in 2013 if they plan to keep their promise, so it's no surprise that they're getting cracking. 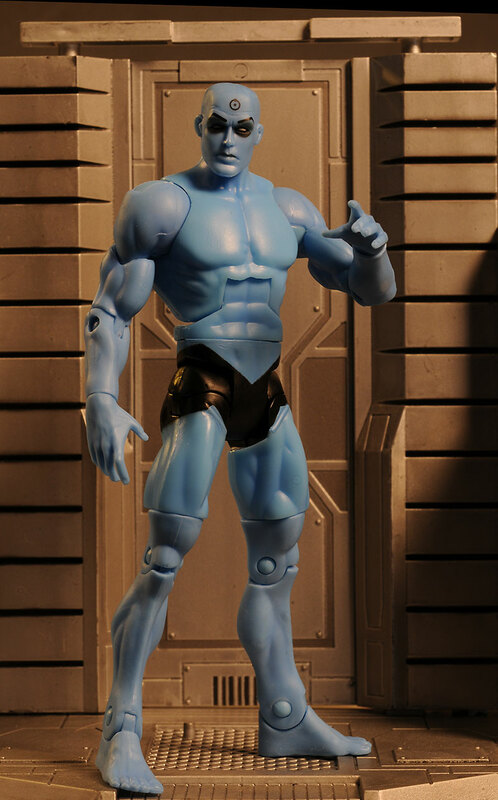 Rorschach came out a couple months ago, and now we have the enigmatic Dr. Manhattan. These are available through the website (and there's a few doctors still available as I type this! ), but they also made them part of a Watchmen subscription. They run $25 each. 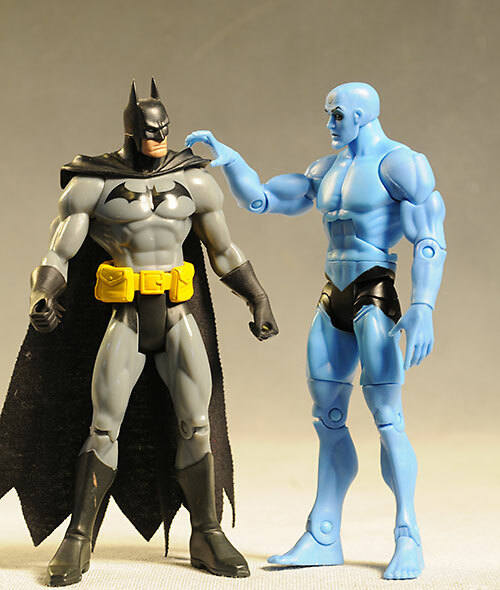 With Night Owl, Comedian, Silk Spectre and Oz still to come, the whole team will look terrific on the shelf with your other 6" scale superheroes, especially DCUC. If I were picking best package of the year, it would be tough to beat the work being done on this series. The bookshelf style boxes look fantastic and are completely collector friendly. Pop the figure and the accessories out, easy peasy, pop them back in, no muss, no fuss, no damage. On top of it, the boxes are designed to look great together on the shelf. 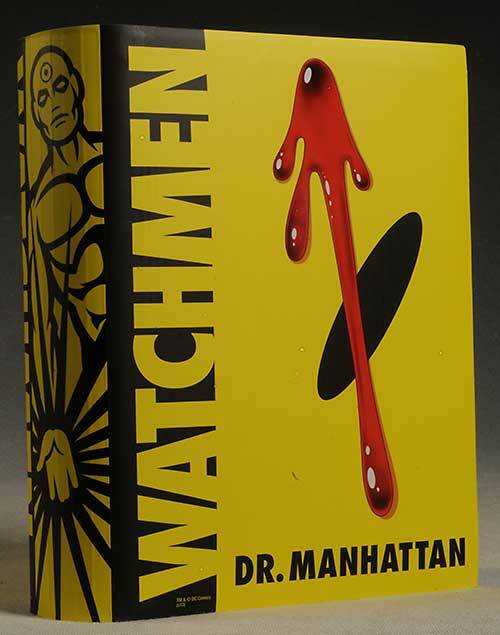 Line up the spines, and you get the graphitti style logo, and from the front you get the Doomsday Clock - how cool is that? 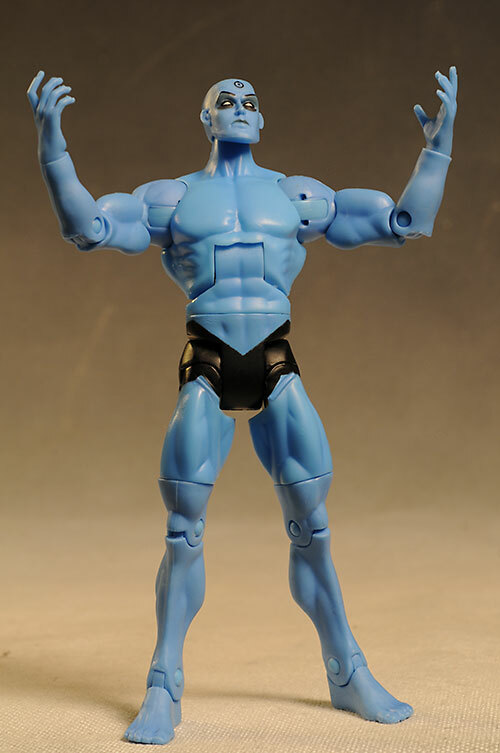 There's not a ton of unique sculpting here - he's a blue nekkid guy, using a body we've seen many times before. There are a few areas though, including the head and hands, that set him apart. The head seems a little too elongated, but it's not that far off the comic look. The hands work great in a ton of poses, including his classic look with his hands to his sides, palms out. The biggest issue with the sculpt - at least in terms of quality - relates to the spurs and excess plastic edging on the body. These are very obvious in person, and detract from the overall appearance. That's not the biggest reason for the low score however. And it's probably not even fair that Dr. Manhattan is the guy taking the hit - it's not really his fault, it's Rorschach's. See, Manhattan is too short when standing next to Rorschach. 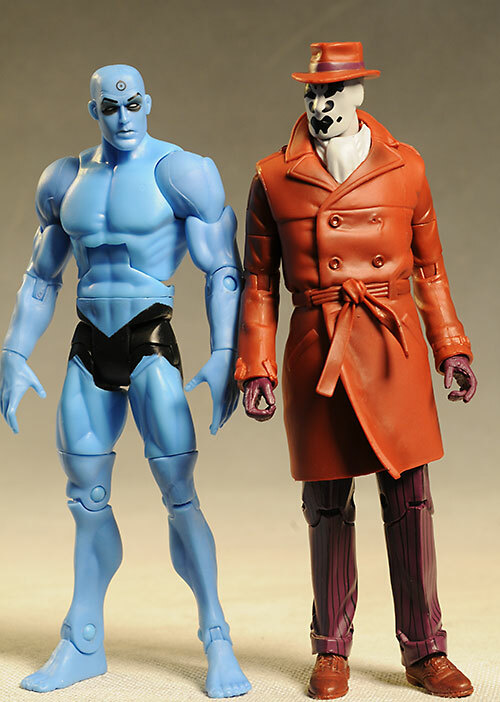 More accurately, Rorschach is too tall for the 6 - 7" scale, and with the dear doctor coming in at 6 1/2", the two are pretty much the same size. If I were reviewing Rorschach second, he'd take the hit for being too tall. But since he was first, it's poor Manhattan who takes the heat for being out of scale. And with a group coming together like this, scale is critical. So when the Comedian comes out and he's too short compared to Rorschach, while I ding him too? Hell if I know. There's not a ton of paint ops here, but the bright blue color is certainly unique (unless you're a Smurf), and very eye catching. The body is cast in the blue, but it's fairly consistent and clean. The pants, eyes, eyebrows, and the tattoo are all black, and painted on. The edges are a smidge sloppy, but it's a fairly minor nit. My biggest issue is with the black around the eyes. It isn't solid coverage, so it looks more like mascara than it should. 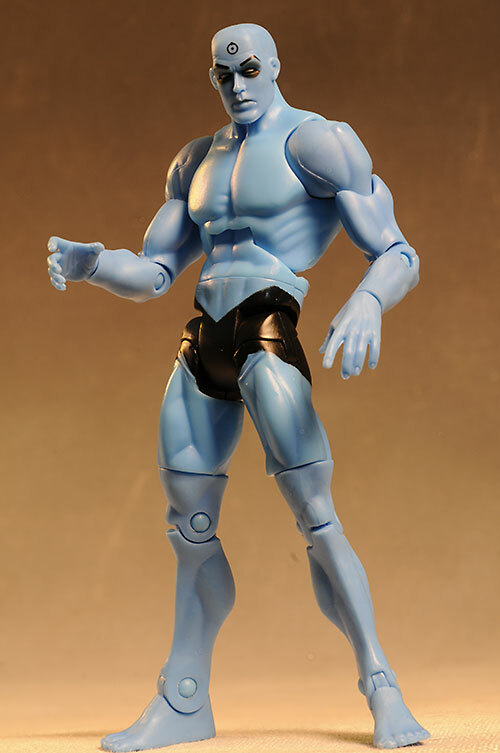 If you're a collector of DC Universe Classics, then you'll be very familiar with the articulation here. There's a ball jointed neck that leans forward and back, but doesn't do a whole lot of tilt. The ball jointed shoulders, pin elbows, cut wrists, ab crunch, cut waist and thighs, pin ankles and knees, hinge hips and cut thighs all work well together. This style of body is one of the best in this scale for creating natural poses, although a slightly better neck joint and a rocker in the ankle would make it perfect. While there aren't traditional accessories - Dr. Manhanttan didn't need to use much - there are a couple extra items. There's the display base, which each of the figures will include. You don't need to have it, but I do love the logo style. Each figure also comes with an 'over sized' (i.e. huge) bio card, which will look terrific displayed behind the figure on the shelf. Still, at $25 most people are going to be expecting something a bit meatier in this category. Even without accessories, this guy is a lot of fun. The articulation goes a long way, as does the basic but eye catching design. I understand that most mass market figures in this scale and with this level of articulation are at least $15 these days. I also get that with a collector series like this, with a very low production run, that costs will be higher. But at $25 and no real accessories, this guy is at least $7 more than he should be. I'm betting some folks would feel ripped at $15. The scale issue is more of a group problem than something simply Manhattan's fault. Had they made him bigger, it would have been smart - it's not just Rorschach that he should tower over, but the Comedian and Night Owl too. While Rorschach should have clearly been shorter than the rest of the group, Manhattan should clearly be taller. This standardized body would work for the middle of the pack, but not the two guys on either end of the Bell curve. The price for what you're getting is a big detractor too - but let's be honest, even though he's the most basic of sculpts and paint, you have to have him to complete the team. 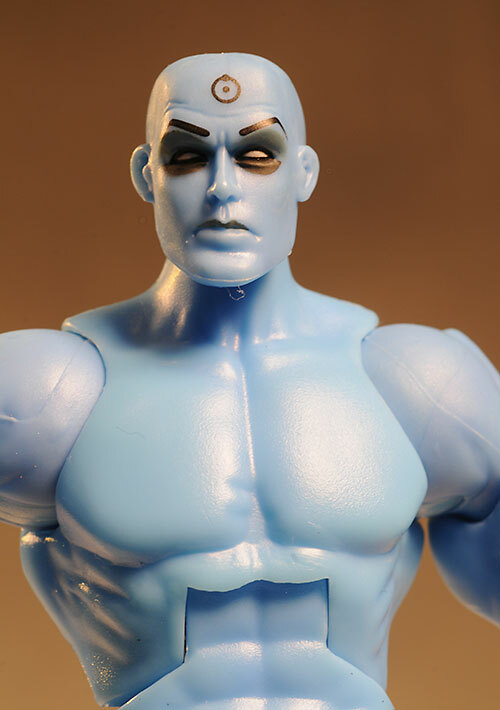 Here's a shocker - as I write this, there's still a few Dr. Manhattan's available for $25 at Matty Collector. Grab him now, or you'll be paying secondary market prices on ebay to complete the team. I covered the first release, Rorschach, not too long ago. And this isn't the first time the license has seen figures, both large and small. Smaller figures that I've checked out include some of the variants, and series 1 split in two reviews, one of Ozymandias and modern Silk Spectre, and the other of Rorschach and modern Nite Owl. 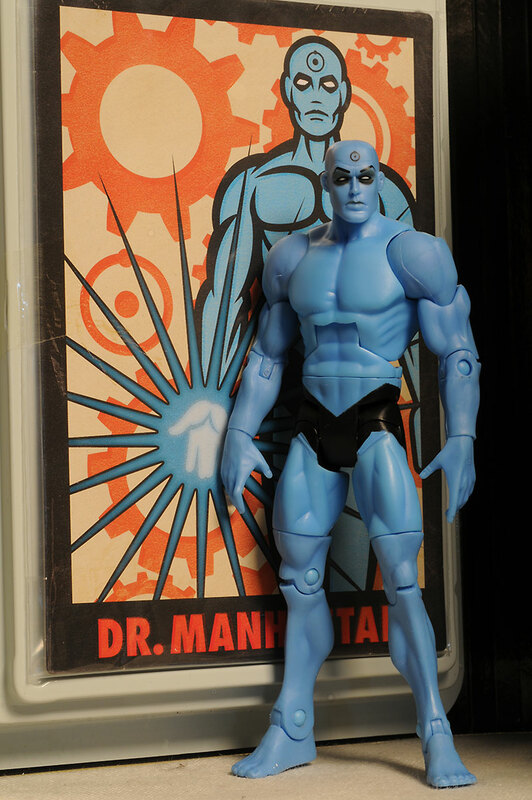 There's also the series 2 review, and I also checked out one of the 13" deluxe figures, Dr. Manhattan. Hot Toys produced two sixth scale figures with the Comedian and Silk Spectre.